Suddenly at Ross Memorial Hospital on Wednesday, March 30, 2016. Lillias, dear wife of the late Daniel Wagg. Loving mother of Eleanor Benson (Tom Drooff), David Wagg, Fiona Wagg (Mike Rutherford), Iris Wagg and Darlene VanHalteren. 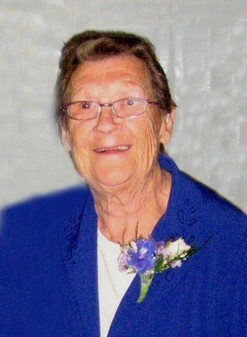 Grandma will be missed by her 10 grandchildren and her one great grandchild. Friends and family may call at Lakeland Funeral & Cremation Centre, 19 Moose Road, Lindsay on Sunday, April 3 for a service at 1:00pm. Reception to follow. If desired donations to the Heart and Stroke Foundation or the Ontario Federation for Cerebral Palsy would be appreciated by the family.